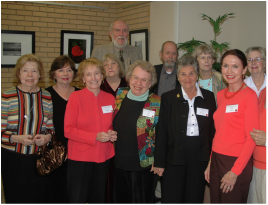 The Watercolor & Graphic Arts Society is probably the oldest arts organization in Mobile and one of the oldest in the state of Alabama. The Society began as an outgrowth of the celebrated Bayou Painters group on June 5, 1948. It was then known as the "Watercolor Society of Mobile" and was open to artists throughout Alabama. There were originally twenty-two members including Genevieve Southerland, Edmond deCelle, William Bush, and the late Bea Q. Tucker. Since then, many well known and well respected artists have become members. Records indicate that the graphic arts addition began in 1954. Today there are nearly one hundred members. As a non-profit organization, the object of the Society is to create, through education, more interest in the media of watercolor and graphic arts, and to promote finer watercolor and graphic arts exhibitions by Alabama artists. The Society holds a minimum of two exhibitions annually, at least one of which is always juried. Only artists working in watercolor and/or graphic arts are considered for membership. To be eligible, a person must be living in the Mobile, Alabama area or vicinity at the time of invitation, and must be duly invited as a guest exhibitor. Criteria for nomination and selection for membership are demonstrated by professional interest and technical ability. The Society is very selective. Two active members must nominate possible members in writing eight weeks before the Member Show. Nominees are then formally invited to join and are asked to submit a resume. Each prospective member must present two pieces in the Society's Membership Exhibit. Current active members choose new members by written ballot. Those who are not chosen are encouraged to reapply, since fierce competition in particular years can exclude talented artists.